Delicious jelly doughnut cupcakes taste almost like Israeli sufganiyot, so popular at this time of year. Even though they are not fried, the egg-free cake batter contains oil instead of margarine, so it is still in the spirit of Hanukkah desserts. Try them with your morning cup of coffee. 1. Preheat oven to 350 degrees and line a cupcake tin with paper liners. 2. In a mixing cup, combine the milk, vinegar, and cornstarch and set aside. 3. In a large mixing bowl, stir together flour, baking powder, baking soda, allspice and salt. Stir the cornstarch mixture and whisk into the flour mixture. Add the oil, sugar, and vanilla, and whisk until blended. 4. Fill the cupcake liners with batter to almost full. Bake for 20-22 minutes until the tops spring back when gently pressed with a finger. Cool completely on a wire rack for 2-12 hours. 5. Fill a squirt bottle or a pastry bag with jelly. Carefully insert the tip to reach the middle of each cupcake. Gently squeeze 1-2 teaspoons of filling into each cupcake. 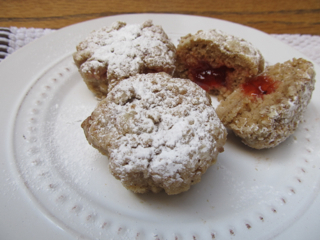 Sift tops with powdered sugar and for a finishing touch, place a candle in or candy over the hole. See how Jelly Doughnut Cupcakes make this cute Hanukkah dessert and more Hanukkah recipes here! designed to bring majesty to the mundane.